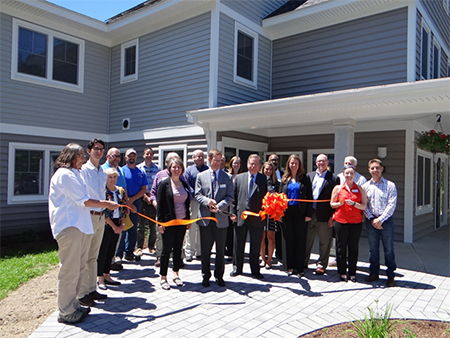 Residents are scheduled to move in this month at Lakes Region Community Developers’ new housing project|! !| Gilford Village Knolls III|! !| which has 24 affordable apartments for seniors in the Gilford Village. Shown at the recent ribbon-cutting is LRCD’s board chair|! !| Jason Hicks|! !| along with the project’s funders|! !| development team|! !| fellow board members and staff. The monthly median sale price of a single-family condominium unit on the Seacoast hit $370,000 in June, breaking the record of $360,500 set in March 2017, the Seacoast Board of Realtors, which compiles its statistics from 13 Seacoast communities, reports. The Realtors said it was the best month for condominium sales since October 2017 although the 69 transactions were off 5.4 percent from last year. June inventory levels were off 6.3 percent from last year, they reported. With inventory off 7.6 percent from 2017, single-family sales fell 12.4 percent from last year. Year-to-date, sales are down 23.3 percent, with median prices up to $450,000, 4.8 percent higher than a year ago. The city of Rochester and the U.S. Environmental Protection Agencyare hosting a downtown design charrette this week. The charrette, part of the EPA’s Greening America’s Communities program, is aimed at helping the city develop an implementable vision of green infrastructure and sustainable design strategies for the Union Street public parking lot and a section of North Main Street between Strafford Square and downtown. The introductory public meeting and open house was held Tuesday night, and several focus groups are planned for Wednesday. The charrette ends with a another open house from noon to 1 p.m. Thursday in the City Hall annex. Plaistow-based Methuen Constructionhas secured a $13 million federal contract with the U.S. Navy to modernize and upgrade dry dock pumping facilities at the Portsmouth Naval Shipyard. U.S. Sens. Jeanne Shaheen and Maggie Hassan announced the contract. Homeowners in Staples Mobile Home Park in Seabrook have purchased their 190-unit manufactured-home park, making it New Hampshire’s 125th resident-owned community, or ROC. 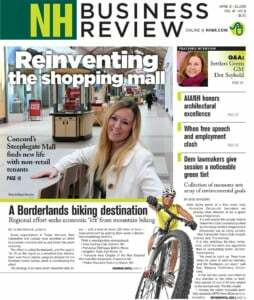 Using training and technical assistance from the NH Community Loan Fund’s ROC-NH team, homeowners formed Seacrest Cooperative Inc. last September after being notified that owner George R. Staples intended to sell the park. They finalized the $11 million purchase June 27 with a mortgage from the Community Loan Fund. Seacrest is the 21st ROC in Rockingham County. Those ROCs contain 1,425 permanently affordable homes in a region with the state’s highest housing costs. Cooperative ownership of the land under their houses gives these homeowners control of their housing costs, now and in the future. A 2,076-square-foot office condo at 42 W. Brook St. in Manchester has been sold by from Mikdanali LLC of Lake Kiowa, Texas, to AESR Realty LLC of Manchester. Mike Reedof Stebbins Commercial Properties represented AESR, and Diane Joussetof Better Homes and Gardens Real Estate The Masiello Group represented Mikdanali. According to the Registry of Deeds the sale price was $177,000. In another transaction, Reed represented the landlord in the lease of 10,400 SF at 4 Cote Lane in Bedford to Fuel Lighting Systems of 250 Commercial St., Manchester, NH. Karen Kulberg of Better Homes & Gardens Masiello Group has been named 2017 Realtor of the Year by the Seacoast Board of Realtors. In addition, Donna Harveyof Stewart Title ahs been recognized as the board’s Affiliate of the Year. A June 22 groundbreaking was held for the R.W. Creteau Technology Center in Rochester. Harvey Constructionis performing the $16.46 million renovation and expansion, with Lavallee Brensingeras architect. Kyle Royhas joined Bedford-based TFMoran as a senior structural engineer. He has over 20 years of experience in structural design and analysis, including the evaluation of existing or damaged structures for commercial, industrial, institutional and residential building types for a variety of public/private clients. The ribbon was cut June 21 for the city of Concord’s new City Wide Community Center. The H.L. Turner Group Inc.of Concord designed the facility and Milestone Engineering & Construction, also of Concord, built the renovation and addition project, which transformed the former Dame School into a community center, which features a new gymnasium, senior center, exercise rooms, offices, a new lobby, locker rooms, and a teaching kitchen. Several North Branch Constructionemployees were honored at the Associated Builders and Contractors of NH/VT annual Merit Shop Night, held June 28 at Northeast Delta Dental Stadium in Manchester. Among those honored were: Gabriele Di Nicolaand Chad Sawin, who graduated from the ABC NH/VT Future Leaders in Construction; andLuc Carrier and Kyle Scheibert, who each received a Certificate of Professional Achievement in Construction Supervision. North Branch was also earned a First Place Construction Safety Performance Award and an award for Zero Cases Resulting in Lost Workdays. Michael Keller,a grandson of company founder Robert R. Keller, has been named sales representative for southeastern Pennsylvania and Delaware. Keller previously spent 10 years with Kalwall in a variety of roles, including drafting, engineering, programing and sales support. Berkshire Hathaway Verani Realty senior advisors Tom Duffyand Mike Charronrecently represented the seller in the disposition of a 28-unit condominium portfolio in Hanover. The properties are located in four separate communities throughout Hanover, including 8 Summer St., 43 Wheelock St., 16 W. Wheelock St. and 41 W. Wheelock St. Total transaction price was of $5.7 million. Duffy and Charron also recently were involved in the $2.99 million acquisition of a portfolio of multifamily communities in New Hampshire, including 70 Lowell St., a 55-unit multifamily property in Manchester, for a combined sales price of $2,990,000.00. In addition, Verani senior advisor Scott Reiffrecently represented the seller and procured the buyer in the sale of 625A Broadway Rd. in Dracut, Mass. Sale price was $1.5 million.